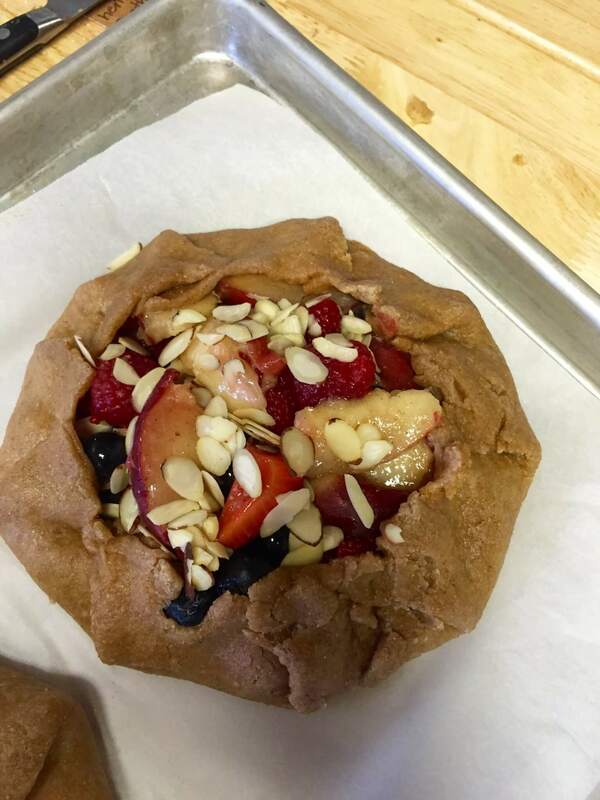 This Summer Berry and Almond Whole Grain Galette combines sweet summer berries and peaches with toasted sliced almonds all wrapped up in a whole wheat pastry crust for a simple and impressive dessert. 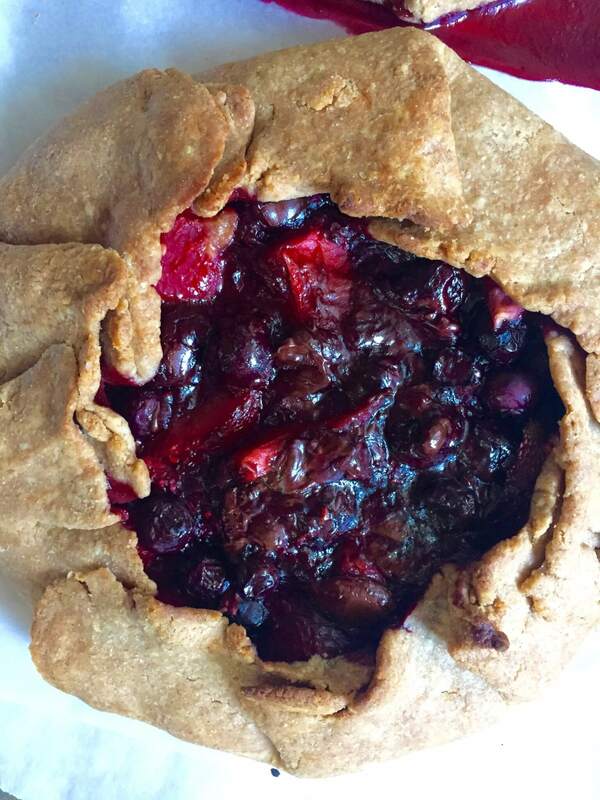 Because peaches and berries are fully in season right now, I decided to combine what I already had on-hand to make my version of a “pie” (aka a galette). 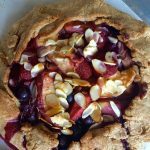 I remember the first time I tried a blueberry galette at taste testing when I was working at Southern Living and I thought how generously simple yet completely doable and tasty it was. Since then, I try to make a galette or two every summer (definitely not as many as I should be making!). 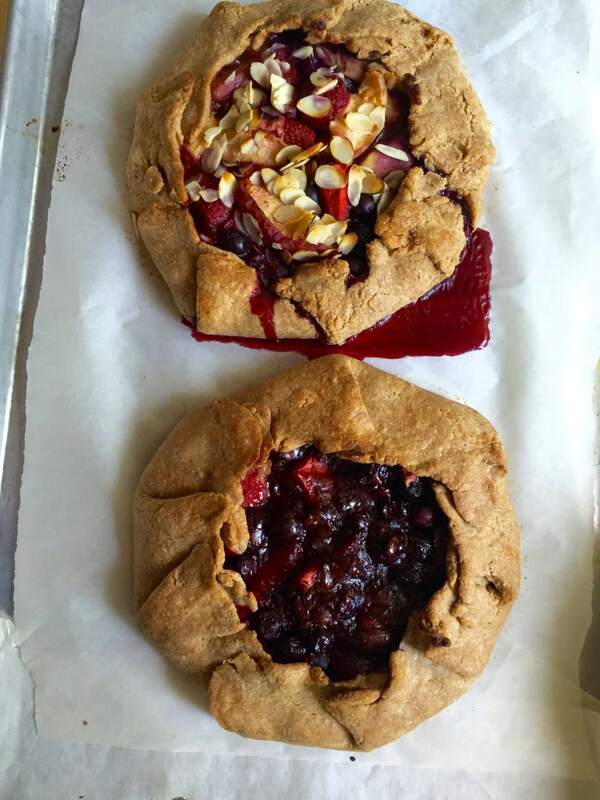 I sometimes think of a galette as a cheater’s version of a pie because you don’t have to worry about the perfect edges, the top cracking or not cooking, etc. However, there is no cheating with this delicious recipe–it’s all homemade and all good. But best of all, it is simple to make! 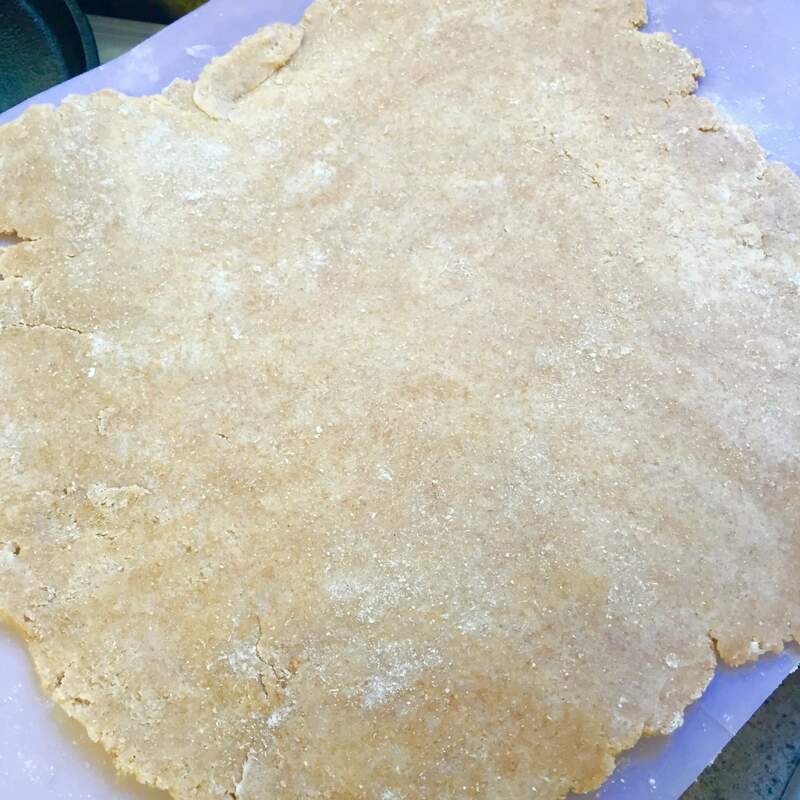 You can easily use a prepared pie crust but to cut back on saturated and in some cases, trans fat, I like making my own. 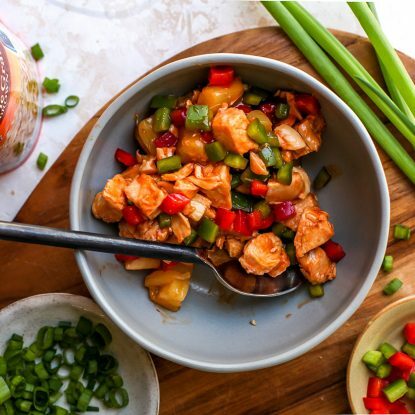 Plus, this healthier version is not difficult to make at all. To make a healthier version of the crust, I used whole wheat flour for a boost of whole grains and fiber. I also like how the flour gives the crust a slightly nutty taste. The great thing about this crust recipe is it has a large yield so you can make one giant galette or two small ones. Because I had some chocolate (and I’m a complete choc-o-holic), I decided to try a version with chocolate chips stirred in. Delish! That’s the great this about this recipe like many of my recipes you know by heart, once you master this version once, you have the roadmap to easily adapt it to include other fruit and nut combos to please your palate. 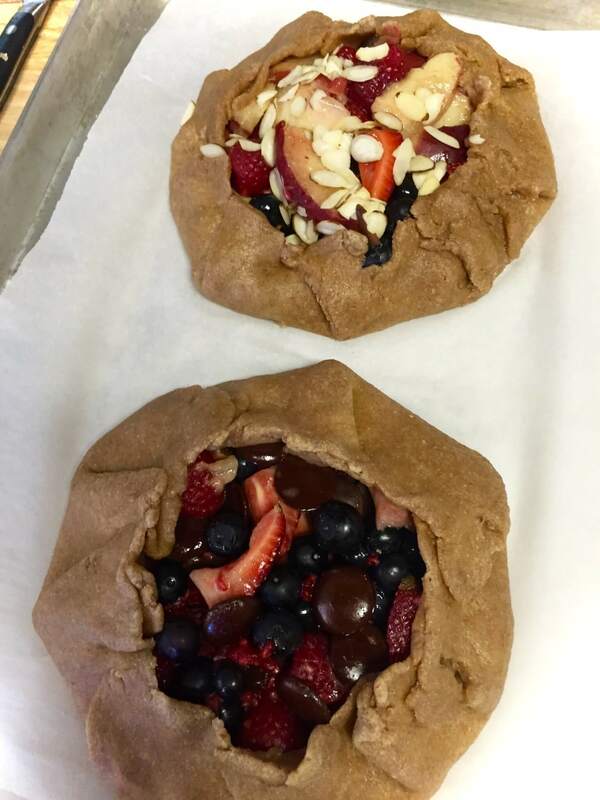 To make the Chocolate Berry Whole Grain Galette, I left the almonds and peaches out but I think they would be a delicious addition! A few things to note about this recipe and the variation. I used vanilla paste (you can find it at a specialty grocery store like Whole Foods) because it offers a closer flavor to real vanilla beans while being more affordable. You can use real vanilla extract if you prefer. I also tried drizzling a little honey over the crust when the galette came out of the oven for a sweet glimmer. It tasted delicious but if you’re cutting back on sugar or calories, you can easily omit the optional step. Ta-da! The finished dish–so simple and SO scrumptious! Now for the hard part–willpower to not eat both of them in one sitting! Chill butter in freezer for at least 15 minutes. Pulse flour, salt, and butter in a food processor till butter is pea sized. Add egg and pulse till dough begins to form. Knead dough together until it becomes one piece. Wrap in plastic wrap and let rest for at least an hour. 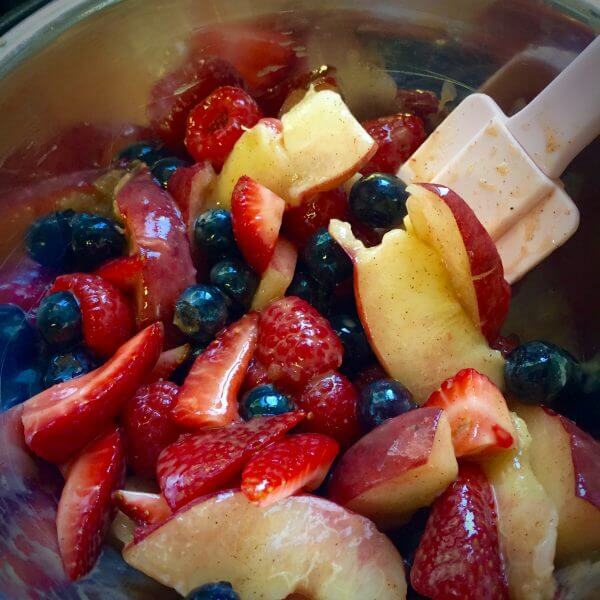 Mix remaining ingredients (blueberries through almonds) together in a large bowl. Roll dough into a circle (or two) that is about ¼” thick. Scoop filling into center of dough, leaving a 1.5” border around the rim. Fold dough over filling, overlapping it as you go around the circle and pinching it tight so it doesn’t unfold while baking. Bake on sheet pan for about 45 minutes or until crust is golden brown and cooked all the way through. Great galette. I love that it is whole grain. Thank you, Catherine! Definitely let me know if you give it a try. Oh my! 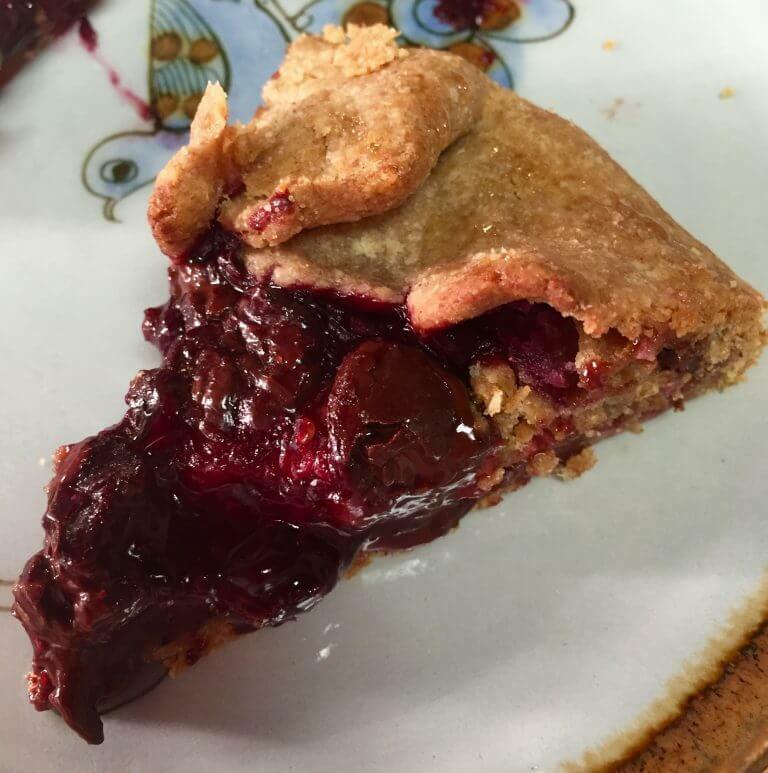 This looks stunning and I love that you used whole wheat flour! It works really well in this crust! Thanks, Kristen! This is a beautiful dessert! I love all the berries combined with the almonds on top – yum! Absolutely and definitely delicious! Thanks! I love how rustic yet elegant galettes look. Love the almonds too! Love the “rustic” description! Thank, Emily! Yes! Love that description! Thanks! 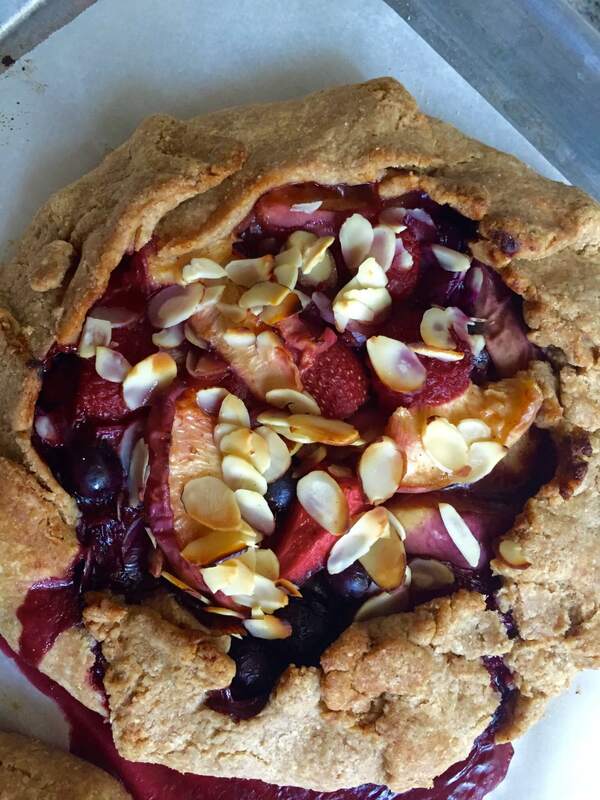 This galette just screams summer. I love how rustic and imperfect they are 🙂 I could go for a slice right about now! YUM. Gorgeous! Making my mouth water just looking at it! 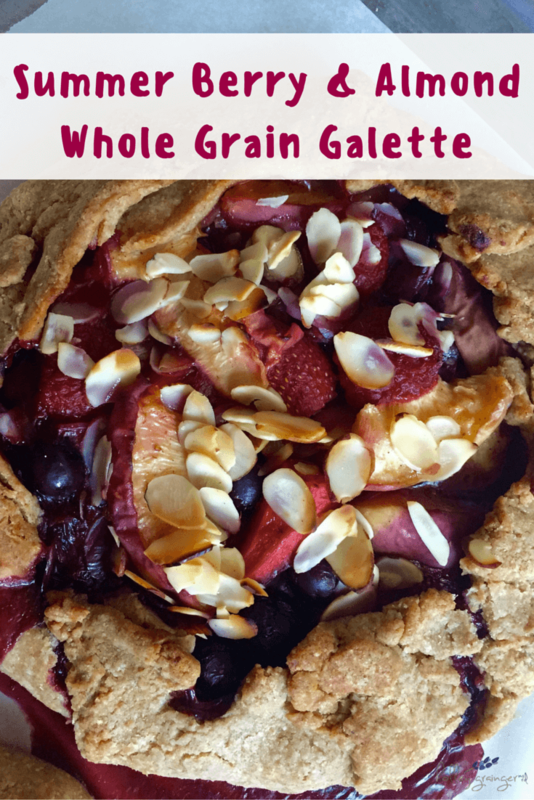 I love the rustic look of galettes and the combination of fruits you have going on here sounds fantastic! This looks amazing! 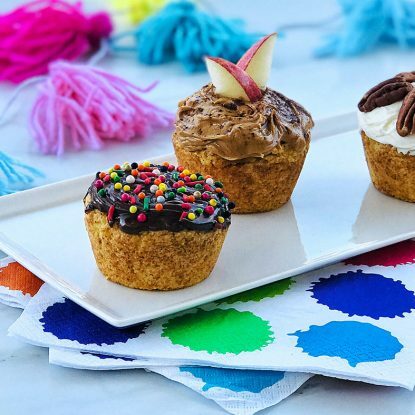 I am going to want to be making and gobbling these up all summer! 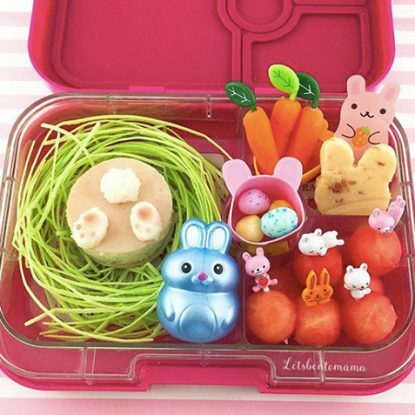 Love the idea of your Recipe Redux group! Will be back to your site to check it out! 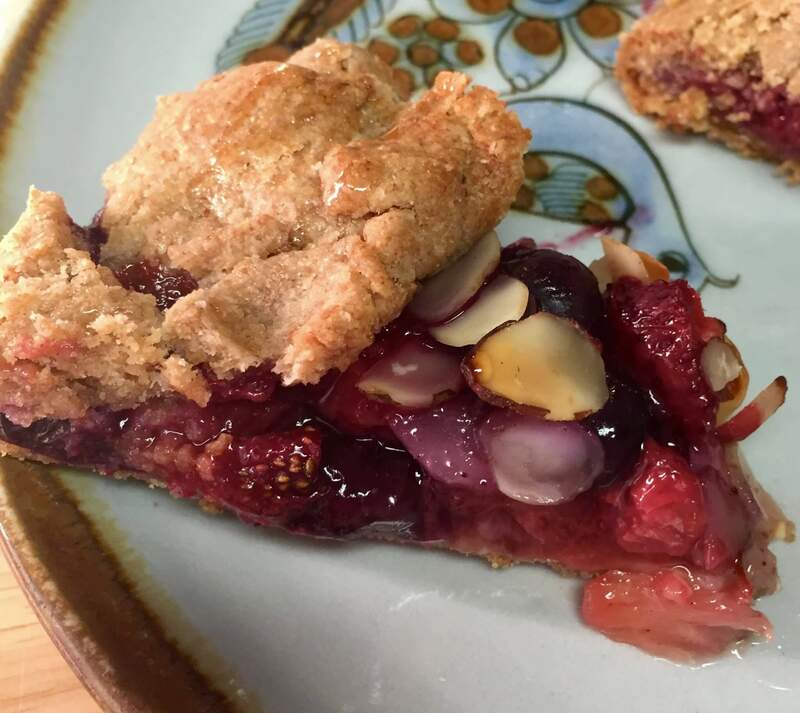 Yes–so many good ideas from the bloggers participating in Recipe Redux. We post on the 21st and 22nd of each month.